A man is being held on suspicion of arson following a fire at a petrol forecourt on the A47 in Norfolk. 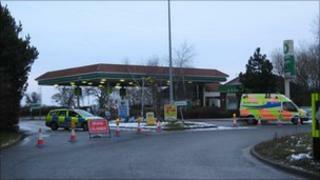 Police cordoned off the area around the BP garage, off the Norwich Road roundabout, near Swaffham, and closed the A47. The incident began shortly after 2300 GMT on Sunday and involved a car alight on the forecourt. A nearby McDonalds restaurant was evacuated. A 32-year-old man is due to be questioned later. More than 25 firefighters were called and the fire was put out within an hour and a half. The A47 reopened at 0500 GMT but the filling station and McDonalds remains closed while investigations continue.